Are you a journalist working a digital rights story on deadline? Have a question that you need quickly answered? Get in touch. We are happy to help! We are happy to start a Twitter-based helpline for answering questions regarding digital rights and other Internet governance issues in Pakistan. If you are a journalist reporting on laws that govern cyberspace in Pakistan and related issues, please read carefully! Under ‘Report for Digital Rights’ we are establishing a Twitter-based helpline for journalists and anchorpersons to shoot questions related to internet governance, laws and policies that govern Pakistan’s cyber-space and digital rights. 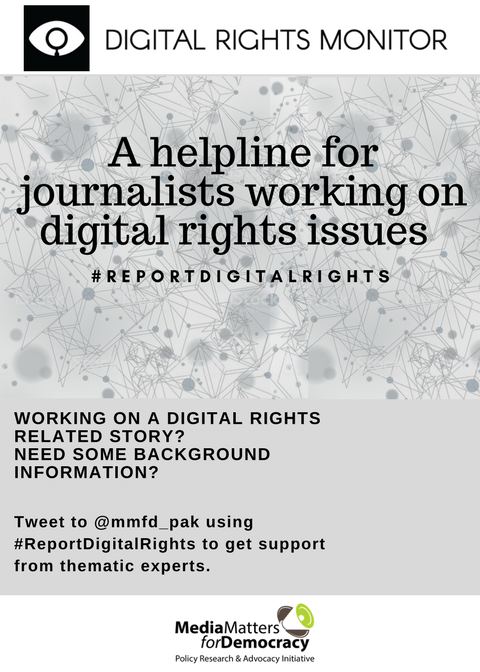 To ask a question, simply type a tweet, tag @mmfd_pak and send to #ReportDigitalRights. From anything to the number of internet shutdowns in Pakistan in a year, to a particular clause of Prevention of Electronic Crimes Act 2016, our team will respond back with a comprehensive answer very quickly. Don’t forget to tag @mmfd_pak. Give it a try. Ask us a question!